AIM: To examine false-positive HIV DNA polymerase chain reaction (PCR) test results in children, and the potential implications for the paediatric HIV epidemic in sub-Saharan Africa. METHODS: A review was done of records over a 6-year period of children less than 18 months old at an HIV treatment site in South Africa, to evaluate those with an initial 'false'-positive HIV DNA PCR result, but later proven to be HIV-uninfected with HIV DNA PCR and/or quantitative HIV RNA PCR tests. We calculated the influence of changing HIV transmission rates on predictive values (PV) of HIV DNA PCR tests in a hypothetical population of all HIV-exposed infants over a 1-year period. (Positive PV: proportion of individuals with a positive test with disease; negative PV: proportion of individuals with negative test and no disease). RESULTS: Of 718 children, 40 with an initial positive HIV DNA PCR test were subsequently proven to be HIV-uninfected, resulting in a positive PV of 94.4%. Most (75%) uninfected children had PMTCT interventions and were asymptomatic or mildly symptomatic (77.5%). Calculations using a test specificity of 99.4%, as reported previously, show a decrease in positive PV using a single-test strategy from 98.6% at 30% HIV transmission rate, to 94.8% at 10% transmission, to 62.5% at 1% transmission. Reduction in test specificity further decreases positive PV at low transmission rates. CONCLUSION: Decreasing mother-to-child HIV transmission rates reduce the positive predictive value of a single HIV DNA PCR test result, necessitating adaptations to diagnostic algorithms to avoid misdiagnosis and inappropriate treatment, especially with early initiation of antiretroviral therapy in asymptomatic infants. We examined our experience of referrals of children incorrectly diagnosed as HIV-positive to illustrate the potential implications in a changing epidemic within the context of PMTCT programme expansion, decreasing HIV transmission rates and an emphasis on initiating ART in early infancy before children are symptomatic. The Kalafong regional hospital serves an urban population in Gauteng Province, and delivers ART care to public sector patients. In this retrospective analysis, we included all records of children <18 months old referred to the hospital's HIV clinic between April 2004 and March 2010, which is the period from the start of the national ART programme to the implementation of the updated 2010 guidelines. The only records excluded were of those initiated on ART before referral to Kalafong. The Ethics Review Committee, Faculty of Health Sciences, University of Pretoria, approved the study protocol. The patient records of all the discharged children after an initial false-positive HIV DNA PCR test were reviewed by a paediatrician with extensive experience in HIV care. Efforts were made to trace the children who were discharged as HIV-uninfected. The samples for the initial HIV DNA PCR tests were taken either at the Kalafong PMTCT follow-up clinic or at regional primary health care clinics. One virology laboratory of the National Health Laboratory Service (NHLS), linked to a tertiary training hospital, processed all HIV DNA PCR tests, using the AMPLICOR HIV-1 DNA Test, version 1.5 (Roche Molecular Systems, Inc.) from 2004 until 2009, and the Cobas AmpliPrep/Cobas TaqMan HIV-1 Qual test (Roche Molecular Systems, Inc.) thereafter. Standard practice in the clinic was to do a confirmatory HIV DNA PCR test and/ or quantitative HIV RNA PCR ('viral load') on all newly referred children <18 months. Additional HIV-testing in children with an initial positive HIV DNA PCR result ('false positive HIV DNA PCR test') was prompted by either a negative confirmatory HIV DNA PCR test or the HIV viral load (quantitative HIV RNA PCR) result being undetectable. Further testing depended on the child's age and included additional HIV DNA PCR and viral load tests in children <18 months, and HIV ELISA testing in children >18 months. The decision to discharge the child as HIV-negative was made by the treating clinician. Children who at discharge, owing to their young age, had not yet had an HIV ELISA test done, were referred to primary health care for HIV rapid or ELISA testing at 18 months. Using estimates of the number of HIV-exposed infants born in South Africa during a one-year period, calculations examined the influence of changing HIV transmission rates on the PPV and NPV of a single HIV DNA PCR test. The literature provided data regarding the number of HIV-exposed infants born in South Africa within a one-year period and the sensitivity and specificity of the HIV DNA PCR test commonly used within the local context. In 40 of the 718 children aged <18 months at the first Kalafong clinic visit, the initial positive HIV DNA PCR test was not confirmed by a second HIV DNA PCR (N=12) or HIV RNA PCR test (N=20) or both tests (DNA and RNA PCR) (N=8). The median age of all patients at first clinic visit was 7 months (range 26 days to 17 months), while the median age of those with initial positive HIV DNA PCR results, not confirmed subsequently ('false positive'), was 4 months (range 1 month - 35 months; one child aged 35 months was referred late owing to lost-to-follow-up after initial positive HIV DNA PCR result in infancy). The ratio of male and female infants referred to the clinic was 1.08 to 1 but, for those with false-positive results, males predominated (ratio 2.08:1) (p=0.04). At HIV re-testing, 15 (37.5%) children subsequently had 2 negative virological tests, and 10 (25%) had >3 negative virological assays, which included combinations of negative HIV DNA PCR and undetectable viral load results. Another 15 (37.5%) were discharged after at least 1 negative HIV ELISA test in addition to >1 negative HIV virological assays (negative HIV DNA PCR test or undetectable HIV viral load). Review of the medical records indicated no discharge to have been inappropriate, and none of the discharged children was later referred back to the clinic as HIV-infected. Telephonic follow-up was conducted in August 2010, and none of the 22 (55%) children who were traceable had subsequently been diagnosed as HIV-infected. As part of the confirmatory testing, 49 HIV viral loads were done on venous blood on 33 of the HIV-uninfected children, of which 40 (82%) were undetectable, while 8 in total had 9 detectable viral load results: 6 (12%) were between log10 2 and 3, and 3 (6%) were between log10 3 and 4, with none above log104 (10 000 copies). The median age at initial positive HIV DNA PCR test for this subgroup was 1.5 months (range 11 days - 9 months), while the median age of the detectable HIV viral load was 10 months (range 1 - 46 months). Five of the 8 children with detectable viral loads, including the one child with low detectable viral loads on 2 occasions, were subsequently HIV ELISA non-reactive, while the other 3 children, all discharged before age 18 months, had 2 subsequent negative virological assays to exclude HIV infection. Of the uninfected children, 30 (75%) had recorded PMTCT interventions, while 5 (12.5%) had no PMTCT interventions, and another 5 (12.5%) had no information recorded. Twenty (67%) mother-infant pairs had received single-dose nevirapine (NVP), 7 (23%) had mothers on triple ART with subsequent infant NVP, 2 (7%) had combined zidovudine (AZT) and NVP interventions, and 1 (3%) had other PMTCT interventions. Twenty-eight (70%) mothers never breastfed their infants, 5 (12.5%) had a breastfeeding history, while in 7 (17.5%) this information was not recorded or not known. According to WHO HIV clinical staging done at the HIV clinic, 31 (77.5%) were asymptomatic or had a minor illness (stage 1 and 2), 7 (17.5%) were classified as symptomatic (with stage 3 or 4 disease), and 2 (5%) had not been staged. In summary: with 40 (out of 718) unconfirmed positive HIV DNA PCR tests and 678 (out of 718) confirmed positive tests, the PPV of the HIV DNA PCR test in the clinical setting at Kalafong Hospital in infants <18 months was calculated at 94.4%. Reasons for these false-positive results can arise from specimen problems or inherent laboratory assay performance, which was not possible to investigate retrospectively, and we therefore continued to examine the relevance of these local results within the wider South African context with a changing HIV epidemic in children. South Africa has a rapidly changing paediatric HIV epidemic, with decreasing transmission rates as a result of intensified PMTCT interventions. The national HIV prevalence among SA pregnant women in 2008 was 29.3% (95% confidence interval (CI) 28.5 -30.1%),2 and with a total of 1 069 300 live births14 this means that an estimated 313 305 HIV-exposed children were born during that year. The sensitivity and specificity of a single HIV DNA PCR test in a research setting in South Africa is respectively 98.8% and 99.4%.9 We used this sensitivity and specificity to estimate the number of infants testing HIV DNA PCR positive and negative with varying HIV transmission rates. Table I shows that the number of positive results that are false-positives increases as the HIV transmission rate decreases. The PPV remains relatively high when tfhe transmission rate is >10%, but drops substantially once the transmission rate is <10%. Conversely the number of false-negative results decreases as the transmission rate decreases, but the NPV remains very high at all transmission rates, approaching 100% with very low transmission rates. Fig. 1 demonstrates the effect on PPV if the specificity of the test were to be less accurate when used in clinical setting than the 99.4% found in the research environment. When the transmission rate is high, the PPV remains high at all levels of specificity; but once the transmission rate decreases, PPV decreases markedly with even a minor decrease in the specificity of the test by one or two percentage points. A similar decrease in the test sensitivity only marginally affects the NPV. Applying the PPV of 94.4% found in the Kalafong cohort, Fig. 1 shows that this would correspond to a test specificity of 99.4% and a transmission rate of between 8% and 9%, which correlates with the clinical experience in the PMTCT follow-up services at the hospital (data not shown). This conclusion suggests that the test specificity as performed in the clinic is probably holding up to the standards set in the research environment. ART has transformed paediatric HIV disease into a treatable condition.1 Early disease detection and access to ART are priorities to reduce childhood morbidity and mortality in sub-Saharan Africa, especially in children <1 year old, with survival benefits even when asymptomatic.7 But placing children on ART commits them to lifelong treatment, emphasising the need for an accurate diagnosis before ART initiation. Our intention was to study how well the HIV DNA PCR test performs in an everyday clinical setting within a large-scale HIV programme. The PPV of the HIV DNA PCR test for children referred to the Kalafong HIV services was 94.4%, which means that 1 in every 18 children <18 months old referred as HIV-infected on the basis of 1 positive HIV DNA PCR test result was subsequently determined to be HIV-uninfected, either because of sample misallocation or inherent viral assay performance. The statistically significant gender distribution of more boys than girls having a false-positive HIV DNA PCR test is unexplained. Although the audit spans a 6-year period in which the PMTCT interventions were not static but expanding, 75% of children in the HIV-uninfected group had access to PMTCT interventions, thereby greatly reducing their actual risk of being HIV-infected. Most (77.5%) children with false-positive HIV DNA PCR tests were asymptomatic or only had minor health problems, and only 12.5% were breastfed, with a risk of late postnatal HIV transmission. This study's main limitation is that it is a clinic-based retrospective audit. Clinicians might not have identified all children misdiagnosed as being HIV-infected. Reviewing the medical records indicated that none of the discharges as HIV-uninfected was inappropriate. We do not have access to all results of follow-up testing, but all of those known to have had follow-up testing were confirmed uninfected, and none was subsequently referred back to the Kalafong ART site with HIV-disease. The expanding PMTCT programme has the potential to rapidly shift the epidemiology of HIV disease in children, uncoupling it from the adult epidemic. There is a striking non-linear relationship between decreasing disease prevalence and PPV of the HIV DNA PCR tests, as shown from the calculations of HIV DNA PCR testing in South Africa that show the rapid decrease in PPV of the test when disease prevalence drops below 10%. This means that countries with improving PMTCT programmes must revisit testing algorithms, as the shifting epidemic itself causes major changes in the PPV of the virological assay. Any quality assurance compromise at clinic or laboratory level potentially decreases test specificity, further rapidly decreasing the PPV of a single positive test. Laboratory accreditation and continued quality control are therefore critical. The NPV of the test is excellent, meaning that a child without continued exposure can safely be labelled as HIV-uninfected with one negative test, even within a possible context of compromised laboratory services with decreasing test sensitivity. 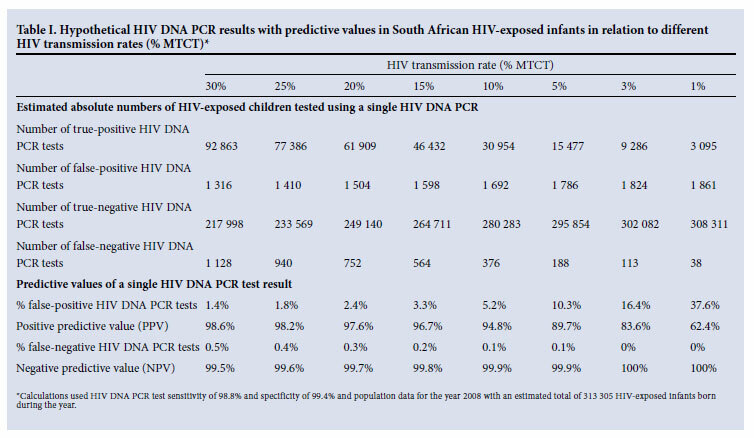 For countries similar to South Africa, with expanding PMTCT interventions aimed at reducing the transmission rate to <5% and the laboratory capacity to do HIV DNA PCR tests, it is strongly advised to move to a 3-test strategy and add a confirmatory HIV DNA PCR test to the current testing strategy for asymptomatic infants who have 1 positive HIV DNA PCR test. The additional cost of testing will decrease as HIV prevalence in children declines and there are fewer positive results owing to PMTCT interventions. Also, costs will be recovered by avoiding ART initiation in HIV-uninfected children. Clinicians must guard against a false sense of security when a test has an excellent specificity as, in a setting of low disease prevalence, the PPV of the test is decreased. This is especially true in a changing epidemic, when the risk of infection status is not constant over time, as is the current situation with the paediatric HIV epidemic in sub-Saharan Africa. Acknowledgements. I thank Ms L Hahne for the development of the electronic database for the clinic; Drs W Thomas and M Poane, and Ms D Sekwakwa, for their assistance with data collection; Professor F Hahne for help with calculations; and Kalafong Paediatric HIV clinic staff for their dedicated service to patients and their assistance with data collection.